From making killer prints with her husband Michael Fusco, to the news that Five Chapters will publish her in book form this coming February, to the other news that she’s working on another book, you get the feeling that we are living through a Golden Period of Emma Straub. My father, known both on and off the internet at Big Pete, is just fine, thank you. In fact, he’s better than fine. Big Pete is a lean, mean, Twitter machine. I’m seeing my parents five times this week. That’s perfectly normal for a 30 year old, right? I should probably call Big Pete and find out. So you’re working on a new book and “Other People We Married” is going to be turned into a book. You’re pretty busy it seems. Yes! 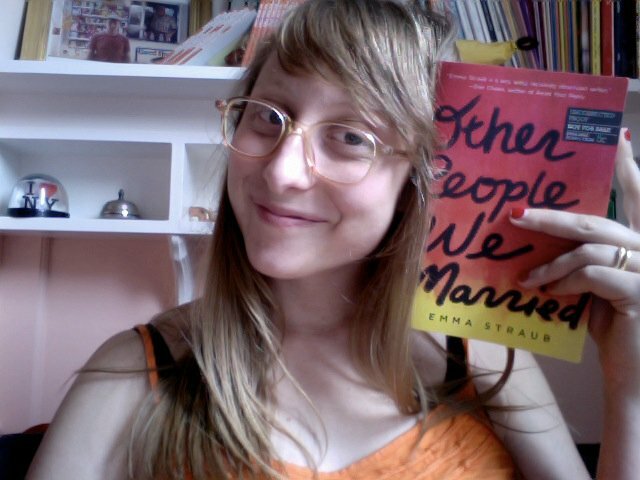 Other People We Married comes out in February, which I am beyond excited about. I’m also working at BookCourt, the greatest bookstore in all of New York City, and screenprinting posters with my husband, and designing wedding invitations. And spending all my free time with my parents. I recently quit editing a literary magazine, though, so I suddenly feel like I have more space in my brain. My goal for the future is to stop doing things for no money. Except for my mentoring gig at Girls Write Now, which pays handsomely in love and amazement. At the Vol. 1 “Greatest 3-Minute Record Review” reading, you read about being a hoochie in elementary school. Is this new book about that? Yes, the entire novel I’m working on is a series of vignettes about myself as a lipsticked 12 yr-old. It also stars slices of pizza and the cast of Beverly Hills, 90210. Not really. Maybe it should be. Oh god. Clearly it should be. What’s the deal with the new book? What’s it about? In fact, the novel I’m writing is about a Hollywood movie star. It starts in 1930, and moves towards the present. A lot of bad things happen to her, but a lot of very exciting and glamorous things happen to her, too. I hope to have a draft finished by the end of September. One never knows. At this stage, I’m just trying to push through, and see where things go. Do you do anything special on a day when you tell yourself “this is going to be a writing day!”? Yes. I wake up around eight, plug myself in, drink gallons of iced tea, ignore all the emails my husband is sending my from downstairs in our house, and try to keep myself engaged. That takes about five minutes, and then I do it over and over again until about three o’clock. I take a lot of breaks. One must snack, after all. Snacking is very important. Also, since this book is historical in nature, it requires me to take fun field trips, like when I went to a 1950s 3-D double feature at the Film Forum last week. I think we’re going to take a field trip to LA in the fall, so I can do lots of fun, dorky things like smell the air and find out which way traffic goes. You tweet a lot about baking, and there seems to be a lot of tweetback about how amazing your baked goods are. Are you going to quit writing to become a full time baker? My bakery would only have a few items: I make a mean oatmeal-chocolate chip cookie, a truly phenomenal brownie, and a raisin walnut bread, but that’s about it. When I’m feeling extra fancy, I bake a cake. Like most bulimics, I just make whatever I want to eat gobs and gobs of. Unfortunately for me, I then forget to purge. I’m an amateur baker, but an absolute failure as a bulimic.